If you are a little bit weak in electronics subject and finding the applications of MOSFET or power MOSFET applications then you are at right place. Here we discuss in details applications of metal oxide semiconductor device. 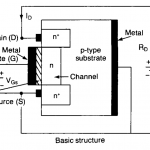 Here we know the everyday uses of MOSFET and applications of MOSFET in electronics circuits. Mosfet is a metal oxide semiconductor device. Mosfet is one special type of field effect transistor. Mosfet has some special applications in electronics and daily life applications. Mosfet is a voltage controlled device. 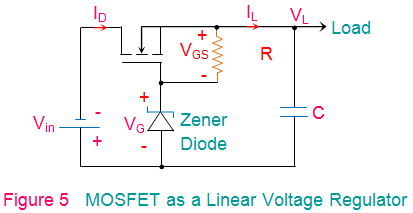 Generally, MOSFET is mostly used as switching and amplifier in electronics circuits. Here are some applications of MOSFET. 2 Why do we use MOSFET? 1. Mosfet is used for some switching applications an in electronics device. 2. It is used in some amplifying circuits. 4. 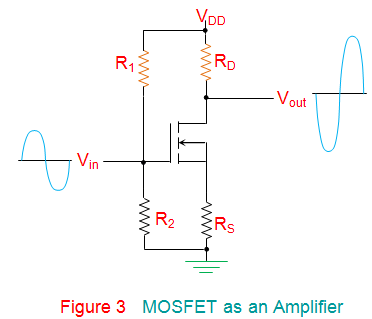 MOSFET can be used as a high-frequency amplifier. 5. It can be used in voltage regulator circuits. 6. It is used as an inverter in some of the electronics circuits. 7. It can be used as a passive element e.g. resistor, inductor used in a circuit. 8. It is used in SMPS ( switch mode power supply ). 9. It is used in some DC brushless motor drives. 10. It is used in DC relay in electronics. Why do we use MOSFET? Mosfet is a metal oxide semiconductor device. It has mainly three terminal – Gate ( G), Drain ( D) and source ( S ). Here gate is isolated from the channel by metal oxide thin layer. A power MOSFET is a voltage controlled device. This MOSFET is used for high-speed switching operations. The switching speed of MOSFET is very high and it has switching time in order of nanoseconds. It also has applications in low power high-frequency converters. Advantages of using MOSFET instead of BJT is it does not have the problem of second breakdown phenomena as in BJT. MOSFET generates very less heat loss compared to BJT at high currents. So it has high efficiency than other devices. So it is used extensively in power electronics. Channel is made during the operation of MOSFET device. As above we saw there are two types of MOSFET. Here we know the application of MOSFET using Enhancement type MOSFET. In this circuit, we are using enhancement mode, an N-channel MOSFET is being used to switch the LED or LAMP for ON and OFF. The voltage is applied at the gate of the MOSFET at that condition the lamp is ON. When the zero voltage level is applied at the gate then the device and lamp is turned off (VGS=0. So by this way, we can use MOSFET for switching operation. And MOSFET has a very high switching device. Here we use Lamp as a simple resistive load and use MOSFET as a switch. But is we want to use inductive and capacitive load then we require some external protective circuits. This protective circuits can be anything simple circuits including free wheel diode etc. Protective circuits are used for protecting MOSFET from damage during inductive and capacitive loads. Hope you understand well about MOSFET switching operation. Here we take basic enhancement type MOSFET for operation. The simple amplifying circuit using MOSFET is shown in the figure. For a good amplifying signal we must require to get an operating point for that circuit. Here input signal is applied between gate ( G) and source ( S ) to generate require gate signal for getting an operating point.An outputt is taken between the drain ( D) and source ( S). Simple MOSFET amplifier is shown in the figure. MOSFET is also used in the chopper circuit. Hereby chopper D.C signal is converted into an A.C signal. 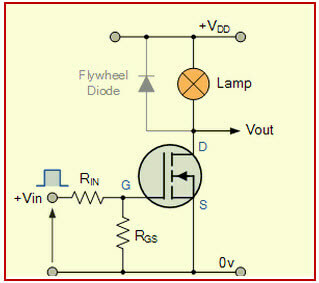 MOSFET chopper circuit is shown in the figure. Vdc is converted into Vac at the same amplitude. Vdc is applied between gate and source terminal. Output Vac is taken at the drain terminal. In Depletion type MOSFETs in source-follower connection are used in voltage regulator circuits. Here linear voltage regulator circuit is shown in the figure. In this regulating circuit, VL follows the gate voltage, VG minus the gate-to-source voltage, VGS. Further with gate-source voltage, VGS increases with an increase in the drain current ( Id). So that the gate voltage is fixed, then the source voltage will reduce as the load current, IL increases. MOSFET is a voltage controlled solid state device. It has a very high switching frequency so that it is used in high-speed switching operation. MOSFET also used as amplifier, copper and as a regulator. Hope now you understand the application of MOSFET. If you have any query related to MOSFET applications in electronics and everyday uses of MOSFET than comment below. We try to solve your problem as soon as possible. Thanks for your interest and keep learning.